MMC was commissioned to manage a portfolio of properties in Nigeria including tin, lead, zinc, silver and gold. MMC conducted all aspects of the assignment from undertaking metallurgical testwork, through feasibility, design, procurement of processing equipment, preparation for export, negotiating smelter contracts and providing skilled labour to install the equipment. 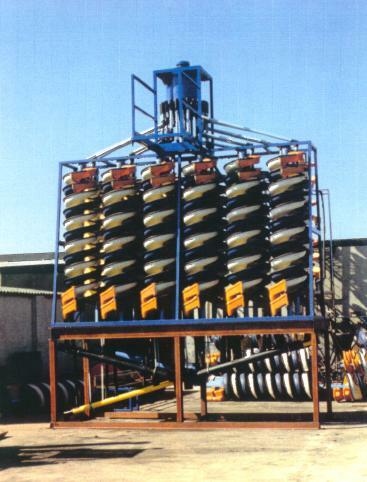 The �waste� was very high grade and was effectively already a concentrate but did not meet smelter size specification and quartz was a major contaminant. Petrographic work showed that the high grade silver was associated with secondary mineralisation on the surface of the ore. A very light grind ball mill was incorporated with shaking tables and spirals to reduce the quartz content. 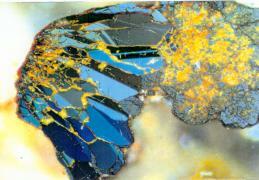 Photomicrograph of the Jos ore, showing arsenopyrite grain. The arsenopyrite forms the bladed crystals on the left; pyrite, largely oxidised to limonite, on the right. 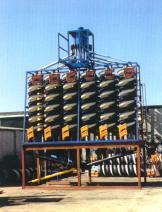 Spirals manufactured by South West Metallurgical Services purchased for the treatment of the Jos ore.